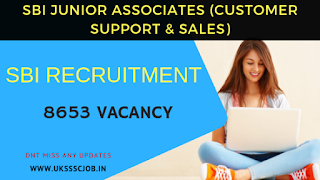 India,s Leading Bank State Bank Of India SBI has issued Official Notification for SBI Clerk 2019 Exam.SBI Clerk 2019 for 8653 available vacancies Junior Associates (Customer Support & Sales) has already begun and candidates are registering themselves with the online application process. The last date to register online yourself for the selection process is April 3, 2019, and after that, no applications will be attended. The recruitment drive will end up hiring 8653 people on the vacant posts of Junior Associates (Customer Support & Sales). The candidates can directly on the official website to apply and follow the procedure that is prescribed. Candidates can get SBI Clerk 2019 Apply Online direct link, Educational Qualification, Pre and Mains Exam date, Exam Pattern, Syllabus and other information by the below-provided article. The candidates applying Online for SBI Clerk Exam 2019 must be a graduate in any discipline from a recognized University or any equivalent qualification recognized as such by the Central Government. Those who are in the final year/semester of their graduation may also apply provisionally subject to the condition that, if provisionally selected, they will have to produce proof of having passed the graduation examination on or before 31.08.2019. Candidates applying for SBI clerk 2019 Exam should Not below 20 years and not above 28 years as on 01.04.2019, i.e candidates must have been born not earlier than 02.04.1991 and not later than 01.04.1999 (both days inclusive). Candidates can apply online and no other mode of application will be accepted. Candidates will be required to register themselves online through Bank's website https://bank.sbi/careers or https://www.sbi.co.in/careers - Recruitment of SBI Junior Associates 2019. After registration candidates are required to pay the requisite application fee through online mode by using debit card/credit card/Internet Banking.